Sterling Publishing (NY), 9781454926993, 192pp. Power up with these 100 delicious, perfectly balanced meals in a bowl--all designed to deliver a targeted blast of energy that will sustain you throughout the day. 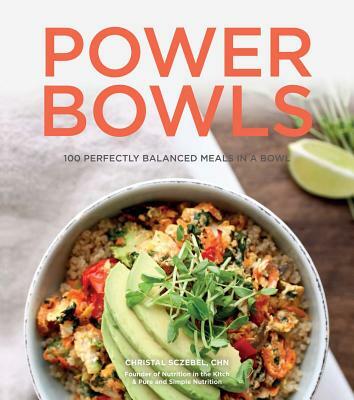 Packed with recipes for all-in-one meals, Power Bowls offers easy-to-make, easy-to-serve dishes containing only the most wholesome ingredients. From nutty quinoa porridge for breakfast to Thai green cashew chicken, all these bowls showcase whole grains, vegetables, fruits, nuts, seeds, high-quality proteins, healthy fats, and natural, unrefined sugars. So whether you're energizing with a carrot cake protein smoothie bowl, lunching on a coconut and lemongrass veggie rice bowl, dining on a Ni oise kale and salmon bowl, or treating yourself to a yummy rich cocoa chia smoothie bowl, you know you'll be doing your body good. Christal Sczebel, CHN, is a Certified Holistic Nutritionist, based in Edmonton, AB, Canada, where she is the owner of Pure & Simple Nutrition, a health and wellness business specializing in whole-foods-focused online and in-person nutritional consulting services. She is the author of Energy Balls (Chronicle) and NutritionistInTheKitch.com, a blog dedicated to her love of healthy eating and fitness.